The Silky F-180 is a lightweight, strong folding saw with 7-inch blade suitable for multiple tasks. Utilizes proprietary Silky MIRAI-ME (Smooth Cutting) Technology - The Teeth of the Future! The precision-ground, razor sharp blade have four cutting angles along the length of the blade and provide fast, clean and smooth cutting action. Blade easily and securely locks into two different angle positions for easy cutting. Handle is constructed of a fiberglass polypropylene with a rubber insert to insure comfortable and sure grip. Large teeth configuration model comes in Red color and cuts quickly through green wood branches and firewood. Exceptional design, strength, balance and superior finish quality. Put this handy, lightweight tool in your pocket, glove compartment or tool box. 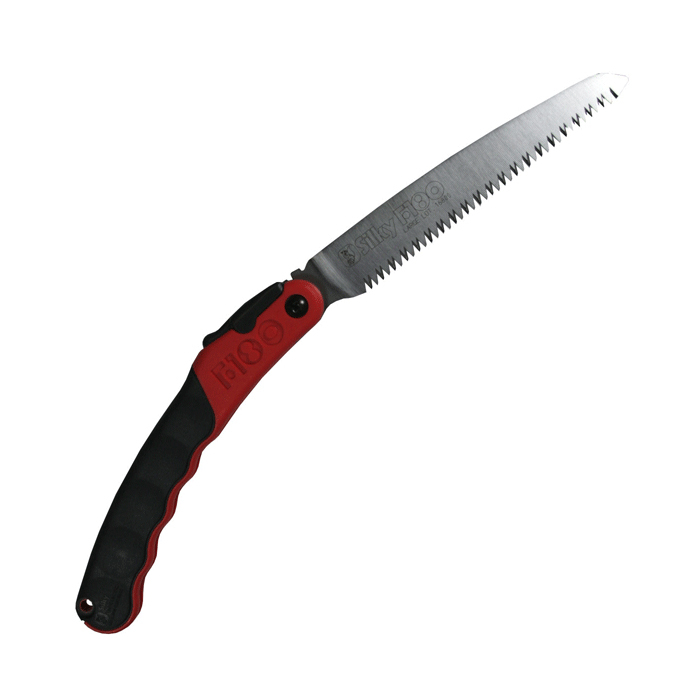 It is an ideal cost-effective all-round folding saw that is always ready for all pruning tasks and outdoor projects. Comes in a blister pack. Made in Japan. We offer spare blades for all of our saws, or we can offer a cheaper price if you buy the saw and spare blade in our combo deals.